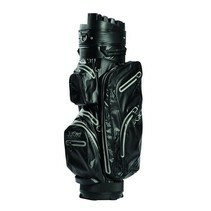 The JuCad Bag Manager is distinguished by many practical functions that facilitate golf life. Because of the nine-compartment club head holder, every iron is fixed and always within reach - flapping irons are a thing of the past. The separate putter sleeve guarantees fast accessibility. In the spacious and practical compartments you have enough space for your complete equipment. Extras, as the separate compartment for a JuCad powerpack and the refrigerator compartment, make this bag an all-rounder.